FedEx flight 80 departed Guangzhou (CAN), China on a cargo flight to Tokyo-Narita (NRT) with the first officer likely acting as pilot flying. The airplane contacted Narita Tower at 06:41 and received a landing clearance for runway 34L. Wind information passed on to the crew indicated gusting winds. As the airplane was probably flying through rough air, the autopilot and autothrottle had difficulties to control airspeed and attitude. At 06:47:40 the CAWS announced 500 ft. The calibrated airspeed (CAS) was frequently fluctuating and at this moment the CAS was about 179 kts. The range of CAS fluctuation was from 152 to 180 kt which was 12 kts slower and 16 kts faster than the selected approach speed of 164 kts. This exceeded the stabilized approach criteria. The pilot monitoring called "stabilize" and most likely let the pilot flying continue approaching, disregarding airspeed deviation of more than Vapp plus 10 kt. The autopilot was disconnected at 198 ft radio altitude, while the autothrottle remained engaged. The pitch angle then decreased from 1.4° while the CAS was 178.5 kts. The airplane was almost on the glide slope at this point. Just after the autopilot was disconnected, the pitch angle temporarily decreased as low as 0.4° but it increased to 3.5° by the time the airplane descended to 92 ft. In the meantime, the CAS decreased as low as 154 ft (Vapp minus 10 kt) and the airplane descended about half a dot below the glide slope. It is highly probable that this large speed decrease stemmed from the inability of the autothrottle system to counteract the large wind velocity change (decreasing head wind component) during the descent and the fact that the thrust was kept at idle during the increment of the pitch angle to 3.5°. The increased pitch angle and corresponding column input indicates the pilot flying's intention to correct the lowered flight path. The CAS increased to 161 kt from 154 kt, but it was still slower than Vapp (164 kt). The deviation from the glide slope had increased to -1.11 dot. The pilot flying began correcting the heading to correct for the cross wind component from the left and align the longitudinal axis with the runway centerline. When the radio altimeter indicated about 48 ft, the pitch angle was 1.1° and a sink rate was about 13 fps. The autothrottle was engaged, and the thrust levers were in the retard mode which started to automatically decrease the thrust below 50 ft, reaching idle when descending through 20 ft. The pilot flying initiated the flare later than usual at 20 ft, not at 30 ft. Rapid and large column input during flare indicates the pilot's recognition of the late flare. The pitch angle remained 1.1° (about 2° lower than usual) until the flare, and the pitch angle temporarily decreased to 0.7° (below 20 ft) followed by the quick increment of the pitch angle to 4.6° in 2 seconds before touchdown. The control column was pushed largely forward (-4.9°) just before the touchdown. The airplane consequently experienced a large sink rate upon the first touchdown as high as 7 fps. Vertical acceleration spiked to 1.63 G and the airplane bounced. The forward control column input just before and during the touchdown most likely resulted in the rapid derotation from 4.6° at the first touchdown to below zero in 1.5 seconds. The decreasing pitch angle, with the main landing gear still in the air, may have made it difficult for the pilot flying to recognize the need for bounce recovery due to his lowering eye point. It may be possible that he didn't realize the airplane had bounced. The airplane then touched down on the nose landing gear with a pitch angle of -1.8°, followed later by the main landing gear. After touchdown the nosegear rebounded off quickly increasing the pitch angle, leading to increased lift, resulting in a high bounce to 16 ft above the runway. The nose dropped again and the airplane landed on the nosegear followed by the main landing gears. As the airplane was rolling to the left, the left main gear first touched down, followed by the center landing gear and the right main gear. The recorded vertical acceleration at this time was 3.06 G. The airplane sink rate was estimated to be 21.5 fps at the third touchdown. It is highly probable that the airplane‘s kinetic energies at the third touchdown exceeded the certification requirements by almost seven times. The left wing attachment point to the fuselage fractured. The fuselage rolled to the left with the lift generated by the right wing and a fire erupted. The airplane rolled inverted and was consumed by fire. In this accident, when the airplane landed on Runway 34L at Narita International Airport, it fell into porpoising. It is highly probable that the left wing fractured as the load transferred from the left MLG to the left wing structure on the third touchdown surpassed the design limit (ultimate load). It is highly probable that a fire broke out as the fuel spillage from the left wing caught fire, and the airplane swerved left off the runway rolling to the left and came to rest inverted on the grass area. b. The PF's large elevator input in an attempt to control the airplane without thrust during the second bounce. c. Large pitch attitude change during the bounce possibly made it difficult for the crewmembers to judge airplane pitch attitude and airplane height relative to the ground (MLG height above the runway). d. The PM's advice, override and takeover were not conducted adequately. It is somewhat likely that, if the fuse pin in the MLG support structure had failed and the MLG had been separated in the overload condition in which the vertical load is the primary component, the damage to the fuel tanks would have been reduced to prevent the fire from developing rapidly. It is probable that the fuse pin did not fail because the failure mode was not assumed under an overload condition in which the vertical load is the primary component due to the interpretation of the requirement at the time of type certification for the MD-11 series airplanes. 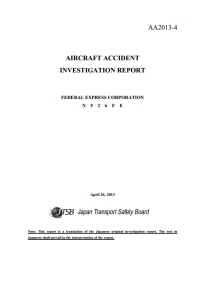 Although the MD-11 airplane was certified to the requirement 14 CFR 25.721(a) under the interpretation at the time of certification, its design would not meet the present interpretation of the requirement since the design allows the possibilities of causing severe damage to the airplane structure in the failure mode under an overload condition where the vertical load is the primary component, resulting in the fire due to fuel spillage. As this kind of design should not be certified from now on, the airworthiness regulation rather than the guidance material should be revised to mandate the assumption of the overload condition in which the vertical load is the primary component. Heat and smoke from the fire reached the cockpit at an early stage after the accident, making it difficult to initiate quick rescue activities from outside. In order to increase the crew survivability, studies about ways to separate the flight crew compartment from heat, smoke and toxic gas should be made, and if there are any effective solutions, the FAA should consider their application to in-service airplanes. In order to reduce the occurrence of MD-11 series airplanes‘ severe hard landing and bounce in which an overload is transferred to the MLGs and their supporting structure, the Boeing Company should improve the controllability and maneuver characteristics by improving the LSAS functions, reducing the AGS deployment delay time and other possible means. Possible improvement on LSAS functions may include: a function to limit large nose-down elevator input during touchdown phase, which is a common phenomenon in severe hard landing cases accompanied by structural destruction for MD-11; and a function to assist bounce recovery and go-around in case of bounce. In order to help pilots to conduct recovery operation from large bounces and judge the necessity of go-around, studies should be made to install a visual display and an aural warning system which show gear touchdown status on MD-11 series airplanes. Distance from Guangzhou Baiyun International Airport to Tokyo-Narita Airport as the crow flies is 2927 km (1829 miles).